Dog airline travel can be a fast, safe, and easy way to make your journey fun and unforgettable. Make sure you understand the rules and regulations before you make any travel arrangements for you and your pet.Leave yourself plenty of time to obtain the proper documentation and find pet friendly travel arrangements. It’s important to do your research for specific airlines since many of their guidelines are different. Every airline provides regulations, restrictions, costs, and safety precautions, so check with your specific airline for detailed information. These are general guidelines, so once again, please check with your specific airline to get the most accurate up to date info. Check with the specific airline you're traveling with to make sure you have an authorized carrier for your dog. Plan your trip as soon as possible because airlines have limited space reserved for pets. 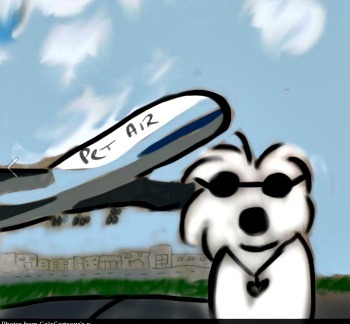 Sedation is not recommended for air travel and can actually be dangerous to your pet. If you do need to tranquilize your dog for any reason, do so with specific instructions from your vet. Understand the correct timing and dosage. Dogs are very sensitive to temperature so many airlines will not permit your dog to travel in extremely hot weather. This is also the case in extreme cold weather, so take the weather into consideration when planning a trip. Try to stay with one airline if you must have a connecting flight. Make sure you understand the difference between domestic and international airline requirements. For international travel, pets need passport-like paperwork that will depend on the country you're visiting. Leave yourself plenty of time to ensure you have the proper documentation. If your dog is prone to motion sickness or gets unusually anxious check with your Vet for remedies. Make sure you take the documents and supplies your dog will need. You can find a list of items here. When in doubt, have your pet checked by a Vet before the trip. Is all of this planning and research stressing you out? Did you know you can outsource this to a professional? Animal Airways will do all the legwork for you and walk you through everything you will need based on your destination, type of dog, and airline.